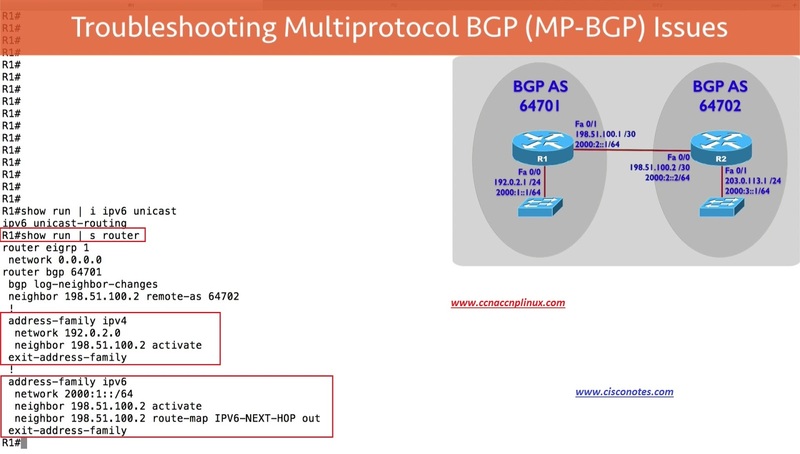 Now we are enabled for IPv6 and there is something else that’s not is obvious going on here, we got a couple of ways setting this up, we could do IPv6 Routing over an IPv4 session or we could do IPv6 Routing over an IPv6 session and i want you to show you the Configuration for both and this topology, i have got an IPv4 session setup between Router R1 and R2, let’s take a look at the Configuration. And you gonna see this looks lot like, the EIGRP Named Configuration or the Address-Families configuration for OSPF, that’s what we have got here, we got an Address-family for IPv4 and we got another Address-family for IPv6. 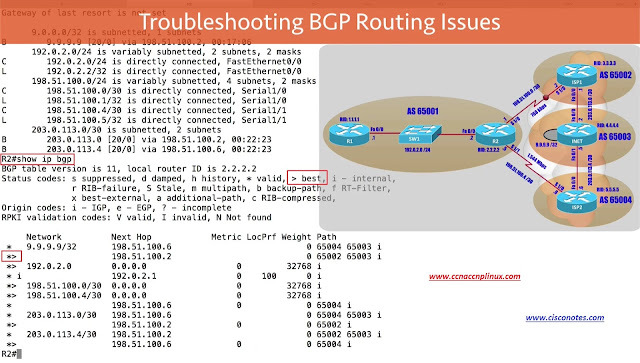 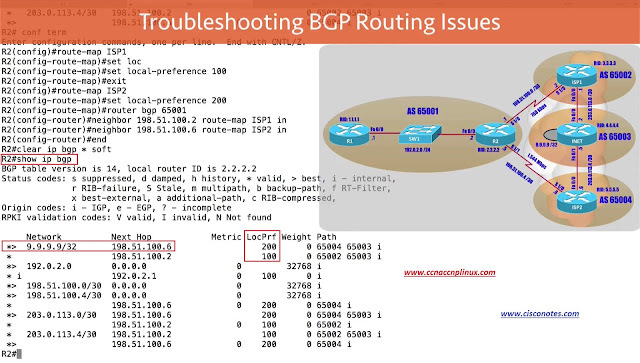 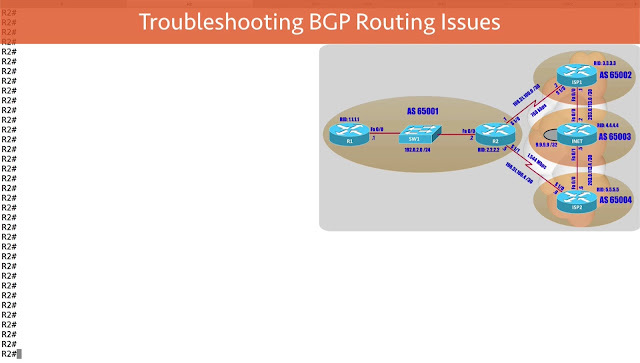 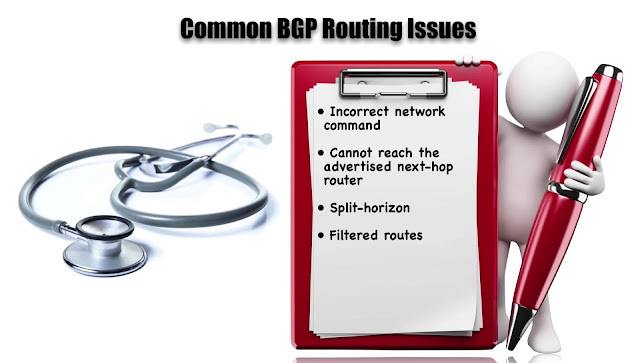 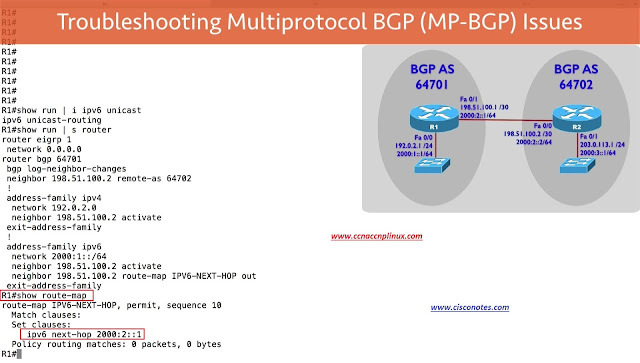 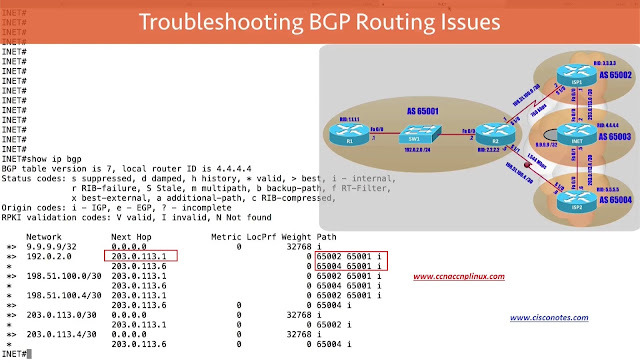 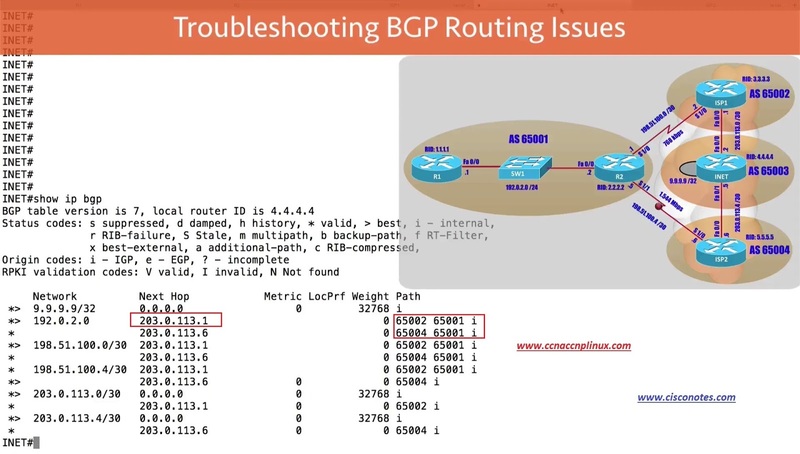 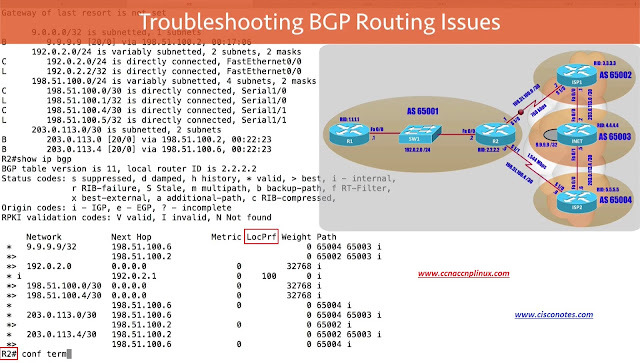 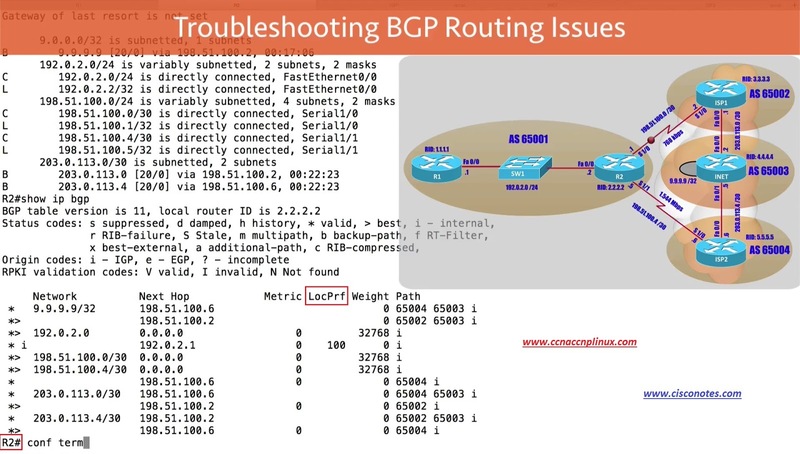 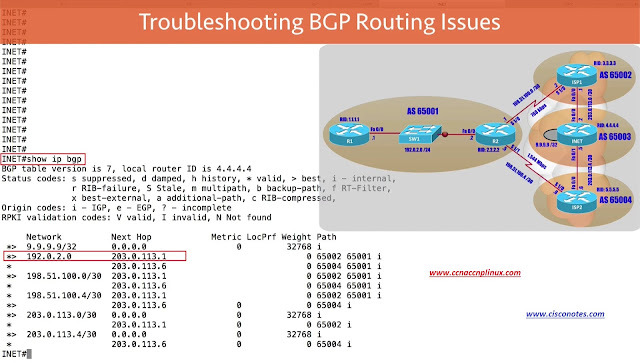 Notice we go into Router BGP Configuration Mode similar to have we do with Traditional BGP or the way we normally talk about Traditional BGP as being BGP Version 4. And you can see that, we are setting our IPv6 next-hop to 2000:2::1 and if you take a look at our topology that’s us, we are telling Router R2 use this IPv6 Address to get back to us if we don’t do this then any Routes that we advertised to Router R2 they are not gonna be injected into Router R2’s IP Routing Table because Router R2 would not know how to get back to us, it would not know how to get to the next-hop so, if we doing this over an IPv4 session, we need to specify that Next-Hop. 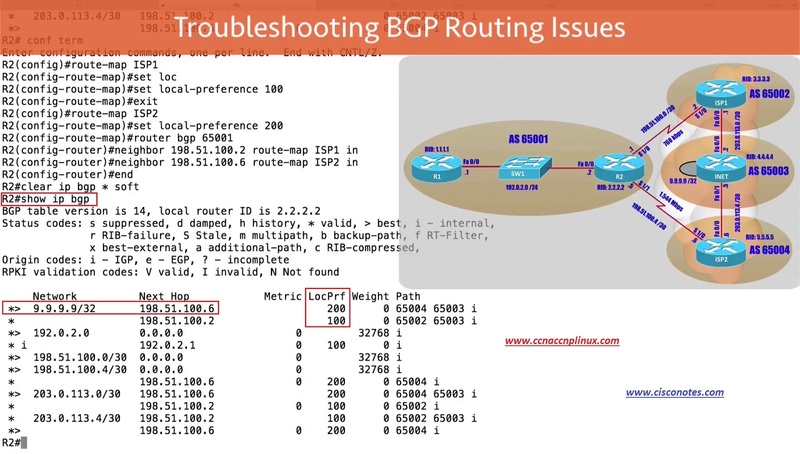 And those are couple of things to keep in mind if we doing IPv6 Routing over an IPv4 BGP session and i want you to show you for contrast what a configuration looks like if we doing IPv6 Routing over an IPv6 BGP session, i am going to update the configuration on this topology right now, and we check that out. 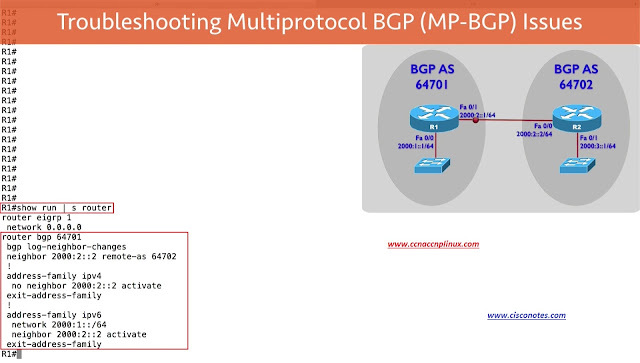 And here you see that configuration is bit simpler, it still using this address’s family approach but i am specifying as my neighbor an IPv6 address and notice that under the IPv6 address-family, there is no need to have a Route-Map Configured as we did a few movements ago when we had a IPv4 BGP session. 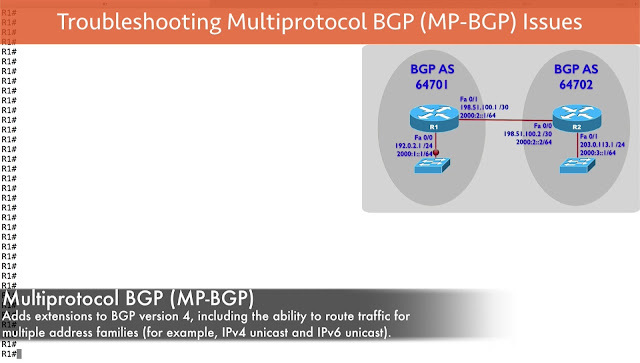 Now this does not mean we cannot do IPv4 Routing as well over BGP it’s just that we would have to setup that separately and that would requires to have here adjacency that might not scale very well for very large network, we get lots of neighbors each of which running IPv4 and IPv6 but in, some cases this is more efficient approach maybe you only want to do IPv6 Routing and If you do this is a fairly simple way to set it up and we do not have to worry about creating a Route-Map. A big point to keep in mind is that when “an advertisement comes into Autonomous System and it’s advertised over IBGP connections to Routers all belonging to the same Autonomous System, by default the next Hop Router information is not updated” and it’s possible that we got a Router residing in this Autonomous System that has a no way to get to the next Hop Address that’s been advertised to in this BGP advertisement. It’s going to cause a Router to advertise its IP Address as the Next Hop IP Address when it’s sending a BGP Routing update to an IBGP neighbors, those are few different ways we might be able to address an issue where a Router within an Autonomous System is not able to reach the next Hop Route advertised into BGP Advertisement. 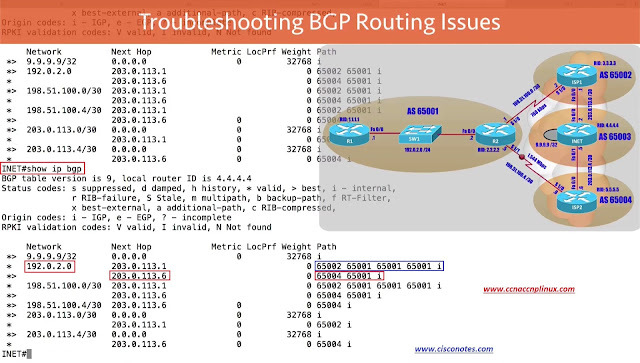 Similar to EIGRP we could have a Split-Horizon issue which say’s if a Route was learned on an interface that interface is not going to advertised the Route back out and in a point to multipoint network maybe like frame-relay that could be an issue. 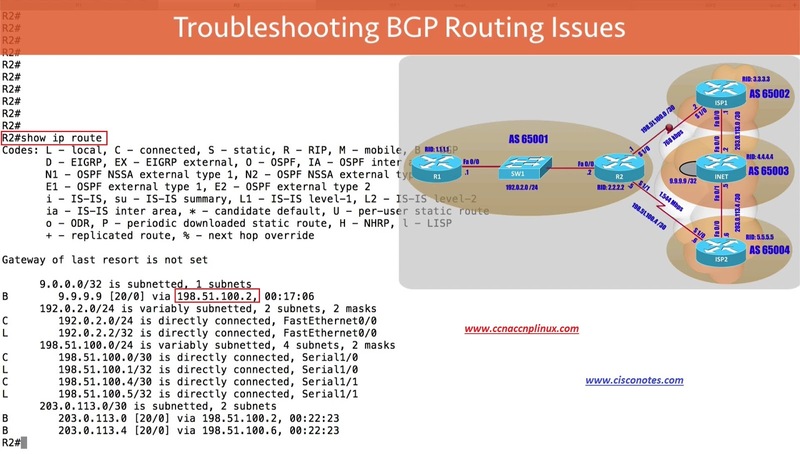 Infect to illustrate that bit further, let’s go out to interface and Troubleshoot a very real world issue when you got an enterprise network connected out to more than One ISP and by default we are taking a sub-optimal path and let’s see how to fix that. 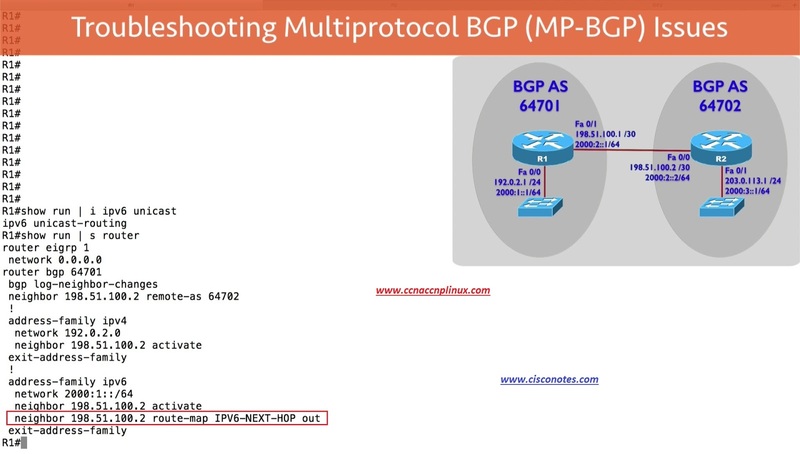 I am using 9.9.9.9 as an example, of some internet destination, that’s actually a Loopback interface on my INET Router on picture, and it looks like to get there i am gonna go via 198.51.100.2, that’s actually ISP1 that’s the slower link and why is that? 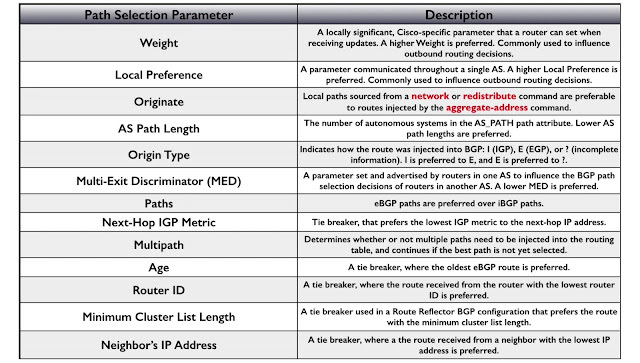 let’s take a look at BGP Table. 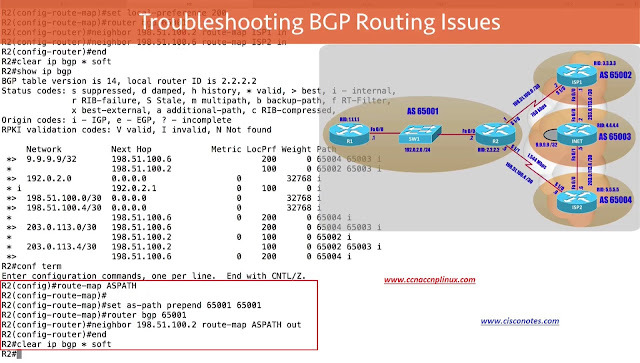 Let’s look at one of Routes inside the Enterprise Autonomous System, 192.0.2.0 as an example, i can get their couple of different ways but notice the Greater than “>” sign is it looks like from the prospective of the internet we gonna go via ISP1 again we going via the slower link and underline causes most likely a lower Router ID(Next Hop Address) and in the Real World, we probably not gonna be able to do any work on the ISP Router we have to do our work on Enterprise Router in this case Router R2, and we want to be able to do Configuration just on R2 to influence both Outbound and Inbound Path Selection. 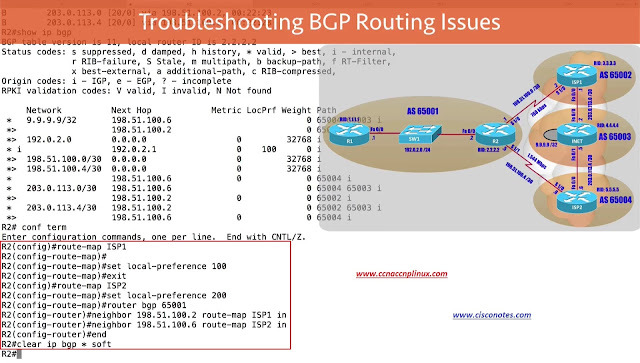 I want to apply that in Inbound direction another word, as i learned Routes from that neighbor, i want to apply the ISP1 Route-Map which is going to assign those Routes to a local Preference of 100, let’s do something similar for the other neighbor for ISP2. And look at this now in order to get to this 9.9.9.9/32 network, we gonna go via ISP2, notice the Greater than “>” sign why is that? It’s because of the Local-Preference there is a Local-Preference of 200 to use ISP2, there is a Local-Preference of 100 use ISP1, we’ve now influenced Outbound Path Selection to prefer the ISP that has more bandwidth however, we now need to Influence Inbound Path Selection, host out on the internet are still coming into us based on the shortest Autonomous System Path so, let’s do this. 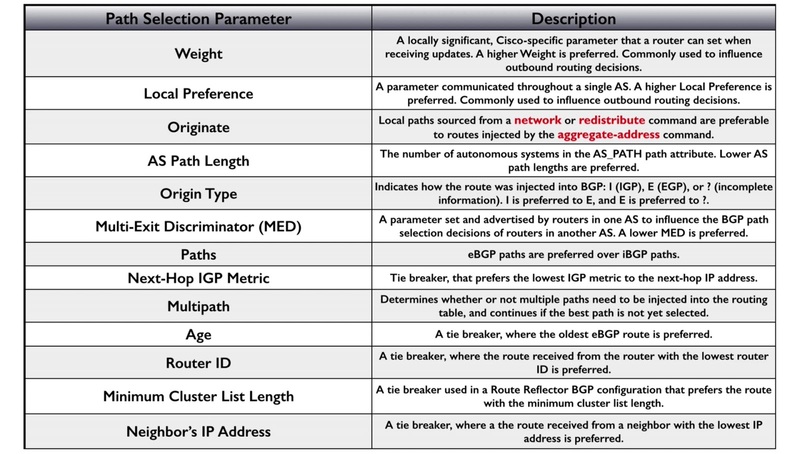 And i am only going to apply this Route-map to ISP1, ISP1 is going to appear to have more Autonomous System to transit in order to get into the Enterprise Network. This time it gonna be Outbound direction when i am sending Route advertisements to ISP1, i am going to be prepending two additional instances of my own Autonomous System to the ASPATH, let’s do a Soft Reset of BGP again. Look at this now get to this internal 192.0.2.0 network inside of our enterprise network the best Path indicating is with Greater than “>” sign, it’s ISP2 why is that? Well now the Autonomous System Path via ISP2 is significantly Shorter then the path via ISP1 and the reason is, we Prepended a couple of additional instances of our local Autonomous System to the AS Path that was being advertised out the ISP1 and that’s a very real world look at how we could Troubleshoot a scenario where we have a sub-optimal path when an Enterprise network is connecting out to more than 1 ISP remember, we need to influence both Outbound and Inbound Path Selection.